A complete and easy to understand guide to the fundamentals of how not-for-profit organizations are formed and run, as well as their structure and the unique accounting and reporting issues they face. 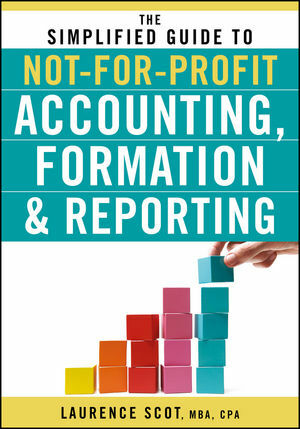 Providing you with a comprehensive understanding of how to maintain the "books" of a typical nonprofit entity and comply with numerous reporting requirements, The Simplified Guide to Not-for-Profit Accounting, Formation & Reporting equips you with everything you need to know to form a Not-For-Profit, setup an accounting system, record financial transactions and report to donors and regulatory bodies. Practical and comprehensive in scope, The Simplified Guide to Not-for-Profit Accounting, Formation & Reporting offers a wealth of practical information to accountants and non-accountants alike for understanding Not-For-Profit financial transactions, financial statements and the many internal and external reports they must prepare. LAURENCE SCOT is the cofounder and comanaging partner of Skody Scot & Company, a midtown CPA firm formed in 1990 that specializes in servicing the Not-for-Profit community. Scot has taught undergraduate and graduate classes at several colleges; been lecturing and giving seminars to CPAs, bankers, NFP D&Os (directors and officers), managers, and entrepreneurs for over twenty years on a variety of subjects; and is the creator of the first in-class certificate program in Not-for-Profit accounting and governmental reporting. CHAPTER 2 NFP ORGANIZATION FORMATION. CHAPTER 4 INTRODUCTION TO NFP ACCOUNTING AND REPORTING. CHAPTER 5 NFP ACCOUNTING SYSTEM AND FINANCIAL STATEMENTS. CHAPTER 6 ASSETS — CONCEPTS AND DATA FLOW. CHAPTER 7 LIABILITIES AND NET ASSETS —CONCEPTS AND DATA FLOW. CHAPTER 8 ACCOUNTING FOR SUPPORT AND REVENUE. CHAPTER 9 ACCOUNTING FOR PERSONNEL COSTS AND OTHER EXPENSES. CHAPTER 10 INVESTMENTS, POOLING AND SPLIT-INTEREST AGREEMENTS. CHAPTER 11 SUBSIDIARIES AND INTERRELATED ENTITIES. CHAPTER 12 BUDGET DEVELOPMENT AND APPLICATIONS. CHAPTER 13 SPECIAL TYPES OF NFP ORGANIZATIONS. CHAPTER 14 REGULATORY REPORTING (990, 990-T AND 990-PF). CHAPTER 15 CONTRIBUTION/GRANT APPLICATIONS AND REPORTING. CHAPTER 16 AUDITS – PREPARATION AND RESPONSE. APPENDIX A TAX-EXEMPT ORGANIZATION REFERENCE CHART. APPENDIX B SAMPLE NFP CHART OF ACCOUNTS.